Several well-known tech stocks surged Friday after reporting better-than-expected third quarter results. 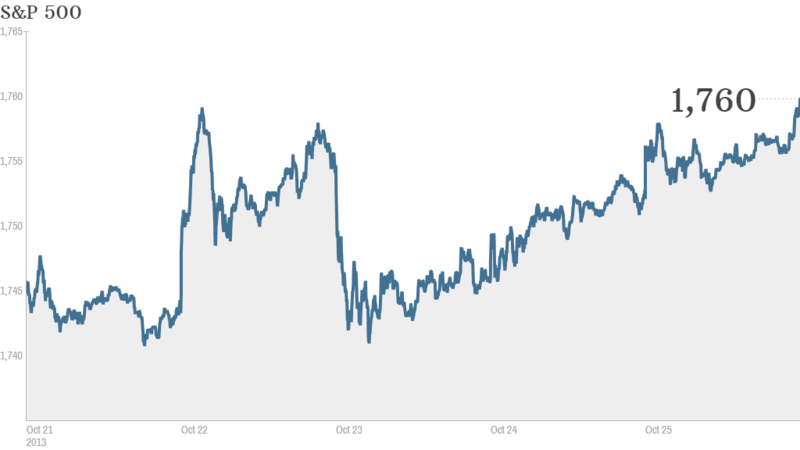 That helped push the S&P 500 to an all-time high Friday. The index ended the week up nearly 1%. The Dow and the Nasdaq rose Friday as well and also ended the week up about 1%. The Nasdaq is within striking distance of 4,000, a level it last hit in September 2000. Friday's tech titans: Amazon (AMZN) posted a loss, but sales were much better than forecasts. Amazon's shares soared nearly 10%. Microsoft (MSFT) easily topped estimates for sales and profits. Those results helped push its stock up nearly 6%. Even Zynga (ZNGA), the troubled online video game company, surprised Wall Street by reporting losses that were slimmer than expected, sending shares up nearly 6%. Other prominent tech companies, such as Yahoo (YHOO) and LinkedIn (LNKD), fell. Traders on StockTwits were closely monitoring the tech sector. AheadoftheNews noted that Amazon and Microsoft were moving up at the expense of Google (GOOG) and Apple (AAPL): "so little cash on sidelines, players have to rotate out of $GOOG and $AAPL to buy more $AMZN and $MSFT. M-A-N-I-A." For Microsoft, which had been a market laggard the past few years, the jump was a welcome surprise. "$MSFT havent see this move like this for many years," wrote bullvsbear. Several traders were wary of the big moves in Zynga, which has been struggling this year: "$ZNGA what justifies this jump? Revenue dropped, users dropped by 50%. Only 1 game in top 50 grossing on mobile. Just don't see growth Bearish," span77 wrote. Don't fight the Fed ... and are consumers really less confident? Investors have been pleased by earnings reports, but they also remained convinced that the Federal Reserve will delay winding back its massive bond-buying program. The Fed has a policy meeting next week and is widely expected to say it will continue buying $85 billion in bonds and mortgage-backed securities a month. The University of Michigan's October reading on consumer confidence fell far below expectations and was also below September's levels. Still, UPS (UPS) is confident that consumers will be shopping in force over the holidays. The shipping giant predicted a robust holiday season, which sent shares up more than 1%. The company also reported quarterly income that exceeded forecasts. Earlier this week, UPS rival FedEx (FDX) said it thought that Cyber Monday, the first Monday after Thanksgiving, will be its busiest day ever. Twitter's IPO is coming soon: Twitter revealed late Thursday that it plans to raise upwards of $1.4 billion in its initial public offering, selling 70 million shares at between $17 and $20 per share. At the high end of that range, Twitter would be worth nearly $11 billion.